When businesses switch their personal Instagram profile to an Instagram Business profile they get a professional looking business profile and access to exclusive Instagram Business features like Instagram Stories, and Instagram Analytics. 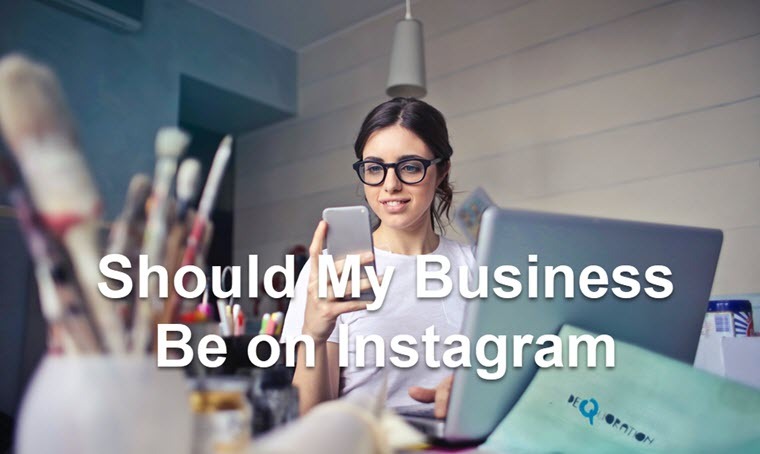 To switch to Instagram Business from an Instagram account, you need to connect to your Facebook business page. Go to your profile by clicking the icon at the bottom right of the screen. Go to Settings and select ‘Switch to Business Profile’ swipe until you reach the ‘Connect to Facebook‘ page. Select your Facebook page and click ‘Next’. Enter your business details: email, contact information, address, and business hours. Click ‘Done’. Your profile page should now be updated and include an icon for Insights (a graph icon) – here you can keep track of stats. HD Profile Picture – This image needs to reflect your brand’s core values. The simplest image to choose would be your company logo. If you are feeling creative it could be anything you want, from the waves on a beach to a red stiletto pump, as long as it represents your brand. Make sure the image looks clear and legible across all devices. Instagram Business Name – Like the image make sure that your username is synonymous with your business. The name should mirror your actual business name so that potential customers can find you. If applicable use relevant keywords or locations in your name to make it easier for people to search for you. (e.g. OgilvyDubai). Remember, your name and username are the only fields that Instagram considers in search queries. Bio – Keep it brief. Summarize your business’s main points, include keywords relevant to your business (e.g. social media, social media management tool). Users typically take a 5-second glance at your bio, so length and relevancy are key here. Use keywords most relevant to your target audience. Links – You can only have one clickable link on your Instagram profile. No, you cannot post a link in your Instagram posts. Yes, this is the major complaint of all Instagram users. Instagram found out the hard way that when more links were allowed, Instagram became a haven for spammers instead of successful businesses such as yours. This Instagram link is placed in your bio, so make it count. A good practice is to change it often to mirror your brand promotions or new products. Many brands just keep their business domain name, without taking full advantage of the one link you have. Hours – If you are a brick and mortar business, that depends on foot traffic to make a profit, you might want to include your store hours. Contact Button – An Instagram business profile also includes a “Contact” button near the top of their profile. With the contact button, you have the option to include directions, a phone number, and email address. Action Buttons – In addition to the contact button, Instagram now connects with other third-party apps: GrubHub, OpenTable, StyleSeat, etc.. Allowing businesses to post an action button on their profile, asking customers to book an appointment, start an order, or reserve their seat, directly from your Instagram Business profile. Connecting with your Current Customers – Leverage your current customer base by inviting your Facebook/Twitter/LinkedIn followers to connect with you on Instagram by going to your Instagram settings on mobile. Now that that’s done, and your Instagram Business profile looks clean and spiffy, it’s time to populate it with great content. What’s the best way to convert prospects into customers? Show your current customers using your products. Ask your current followers to post a photo of them using your service or product, linking their photo with a # (e.g. #Pepsi4theWin) and your brand will gain new fans. Give your current and prospective customers a look at your company culture. Photos of your workspace, company outings, and conference attendance give your customer an intimate look at your brand. Attracting fans, potential employees, and possibly future investors. Have you ever felt happy or sad, while looking at an image? An image of a little girl with her mother might make us happy, while an image of the same little girl sick in bed might elicit sympathy. Getting emotional responses from users will make them engage with your content more. Use emojis in your posts to attract more attention. A snowman photo coupled with an XMAS emoji will most likely attract more comments and likes then a plain photo. In 2017 posts containing emojis saw more engagement than their non-emoj counterparts. Use hashtags to promote your posts. Hashtags can be brand specific (e.g. #eClincher, #eClinchersocialtool), or campaign specific, (e.g #eClincherpromo18, #eClincherG2Crowd), as long as they remain relevant to your business. Creating brand hashtags makes it easier for people to find your Instagram Business profile and content. Even though an Instagram post can have 30 hashtags, we recommend using 3-5. In addition to using your business hashtags, we recommend using popular or themed hashtags for additional exposure. These hashtags are used by millions of users across all social platforms to describe a certain state of mind or emotion. Therefore users searching for these specific hashtags on Instagram might run into your Instagram Business posts and profile. Note – Adding popular hashtags like Throwback Thursday will reach the mass audience while adding industry-specific one like #socialmediatool will be more targeted to your business demographic. Enter the service/product your business provides in the Instagram search bar, to see more suggestions. Instagram Stories consists of a slideshow that is prominently displayed under the Instagram logo, it’s only live for 24 hours (can be saved and re-used at a later date). Instagram Stories can be pictures, live videos, videos, stop-motion’s, and rewinds. Accompanied by image filters, masks, stickers, and text. All photos and videos you add will play in the sequence they were added and you can add as many as you like. Instagram Stories are often used by businesses for product announcements, behind the scene footage, and live conference feeds. This Instagram Story from Cosmopolitan magazine highlights their new office furniture, which is labeled by brand name. Instagram Stories Ads are ads that are shown when your target audience views Instagram Stories. Since over 300 million Instagram accounts use Instagram Stories, these ads can be very effective for businesses. With these ads, you can target your brand audience, insert specific CTA’s (call to actions) to promote your brand and show your brand to the world. Instagram Business users can use Instagram in-depth analytics platform to see how their channel is performing. To access Instagram analytics just click the graph icon at the top of your profile. Instagram Analytics tracks pertinent data in three major categories: Activity, Content, and Audience. This category consists of Profile Visits, Website Clicks, Email Clicks, Call Clicks, and Location Clicks. Discovery includes Impressions and Reach. Reach is the number of unique users that have seen your posts this week (repeat visits are not counted.) Impressions are the total number of times all of your posts for the week have been seen. Content provides an overview on how your posts, stories, and ads are performing. These metrics can be used to determine your content strategy going forward by seeing what content resonates with your audience. Audience provides information about your followers. Showing you the total number of follower you have, the cities/countries most of your followers reside in, their age range, gender, and the hours and days your follower are most active. These insights can be used to formulate your content strategy, and the days/times to post.